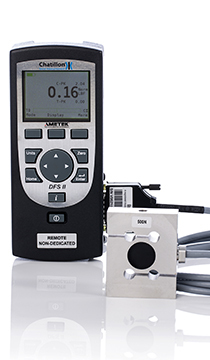 The DFS II R ND Series is a remote non-dedicated digital force gauge with an SLC load cell. When combining this digital force gauge with the STS Series of remote torque sensor, the digital force gauge becomes a torque measurement device offering the user the flexibility of having force and torque measurement in one single instrument. This digital force gauge allows the user to change the SLC load cells, adding the flexibility to use one base indicator and several load cells to meet different testing needs. It is ideal for performing tests in places where a handheld gauge would not fit. The DFS II R ND is easy to use and designed for basic and complex applications. Ideal for handheld applications, the DFS II R ND may be equipped with integral load cells or a smart remote sensor for load measurement or torque measurement. Measurement accuracy is better than 0.1% full scale in integral load cell or dedicated remote models. Find out which adapter you need for your DFS II R ND digital force gauge in this Connection Diagram. Find the Declaration of Conformity for the DFS II R ND Series force gauge here.